When your kiddo is looking to head out into the great outdoors and enjoy some fun in the autumn sun, there's no better way to ensure that they're going to have a blast than letting than if they go along with a cuddly buddy. Now, Rubble might not be the pup in charge of security, but he's certainly a bulldog that can be trusted to keep all of his buddies warm, secure, and feeling supported! Perhaps that's why he's in charge of construction. Building up that spirit, too! 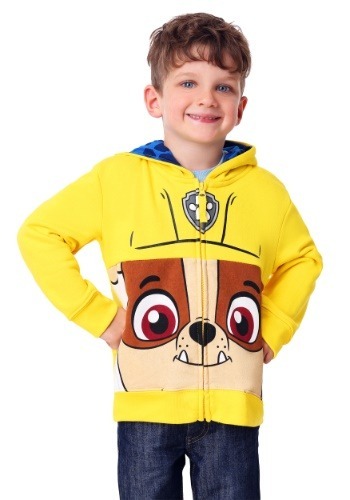 Your kiddo is going to feel like you've built up a great support system around them when they've got this officially licensed Paw Patrol Rubble Costume Hoodie around their arms. Not only is the bright yellow a great color, but the hoodie features Rubble's goofy grin and the wrench and bolt collar image at the neck. Zip up the fun and pull up the hardhat hood and your kiddo will be ready for anything! Rubble and your kiddo in this hoodie will have two things in common. Not only will they be snuggly warm and gearing to go thanks to the hoodie fashioned after Rubble's own gear, but they won't be able to wipe the smile off their face (or their tummy)!